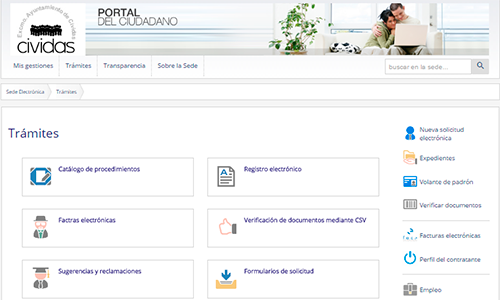 Our e-Administration platform includes everything necessary to facilitate online interaction between public administrations and citizens and to streamline internal processing tasks. Electronic Headquarters makes this interaction possible, eliminating travel, waiting, schedules and personalized attention for routine matters. Citizens can be served more quickly and more comfortably, while public employees can dedicate themselves to higher value tasks. 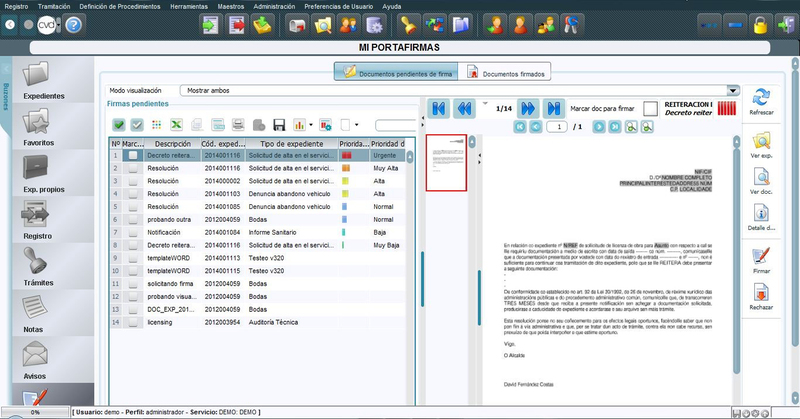 Combined with that, our complete file manager greatly speeds up its processing, with two fundamental benefits: It reduces the response time to the requests of citizens, and it improves the efficiency of the Administration staff. All these advantages translate into citizens more satisfied with their Administration, more public employees completing their tasks, and a government office that performs better with the public resources that have been assigned to it. Enables an Electronic Office for citizens. Register the received applications electronically. Send telematic notifications to citizens. Publish all your public contracts. The Electronic Headquarters is the online version of your Administration, in which any citizen can perform the same actions as in their physical headquarters but without leaving the comfort of their home, without time restrictions, and without queuing. Through prior identification, citizens can consult the status of their files or their history through different electronic means with an Internet connection (such as a PC, Tablet, or Smartphone). It is completely configurable graphically and intuitively and allows publishing of all kinds of information for your citizens from publishing a call for competitors to allowing the downloading of official documents such as voter registration. All information about each of the services offered by your Administration is compiled into a single point to facilitate your consultation and update. How to apply, what are the deadlines, required documentation, requirements, frequently asked questions, legislation, documentation and related procedures, laws, ordinances, offices and telephones, and more. It also has the possibility of sharing online with citizens through your Electronic Office, and even allows the sending of electronic applications using secure identification systems. The distribution of work among public employees is done automatically thanks to the process engine (workflow), following the work flows previously defined by the Administration. In this way, each public employee always knows what tasks to perform and their priority, reducing the effort inherent in the coordination of activities and avoiding unnecessary meetings, calls, and emails. Public employees have a task mailbox in which they are automatically told what they need to optimize their time and coordinate effectively with their colleagues. 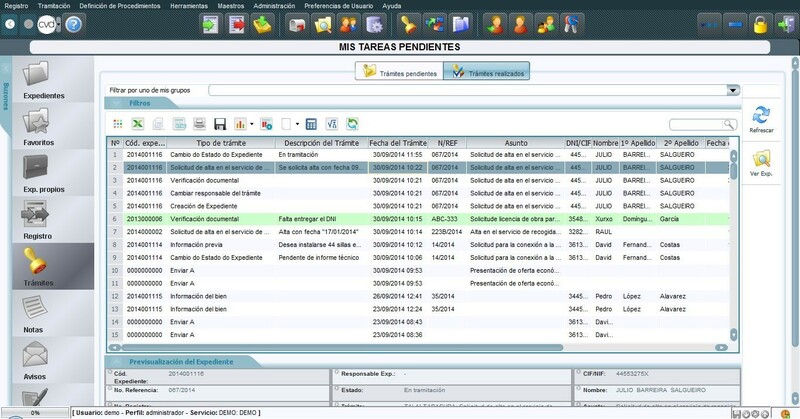 During the processing, the officer has different tools with which to facilitate their daily work, streamlining their access to updated information (centralized document repository), automating routine tasks (generation of templates) or allowing the exchange of data with other administrations and applications for internal use (connectors); among other advantages. All of them improve their performance and their quality of life at work. The digital signature is the technology that provides legal validity to an electronic document, ensuring its authenticity and integrity, specifically the verification of the identity of the signer and that the document has not been modified after the moment of its signature. As well, our signature card shows the user all those documents that they have been assigned as signatory and are still pending signature, even giving the possibility to sign several documents at the same time to save time. Official communications sent to citizens or companies that have previously requested this option, completely secure thanks to the integration with certain systems. The acceptance or rejection by the recipient automatically generates a voucher with the same legal validity as if it received a certified letter. Among other advantages, this system allows the generation of notifications from procedures, massive sending, programming for a specific date or the consultation on the part of the citizens of its history of notifications through the Electronic Headquarters. It is a type of notification that is optional and allows coexistence with face-to-face notifications. The Administration can design any additional component that it needs (services, files, procedures, workflows, forms and document templates) in a graphic, simple and intuitive way, without the need for programming knowledge.